Pet natural stress relief. 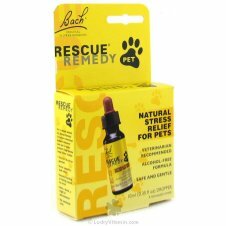 -Alcohol-free, it is suitable for use on pets of all shapes and sizes. Works wonders for animals that are impatient, fearful, have been through a traumatic situation, have fear of thunder and fireworks or do not feel themselves. Add 2 drops in their drinking water and you'll see how quickly they return to normal. -Use for visits to vet. -Use for fear of loud noises or separation anxiety. Inactive Ingredients: 80% Vegetable Glycerin, 20% water The original Bach Flower Remedies has been used on humans and animals for more than 80 years.